Op. 5, No. 2 in A Minor and Op. 5, No. 3 in E-flat Major. 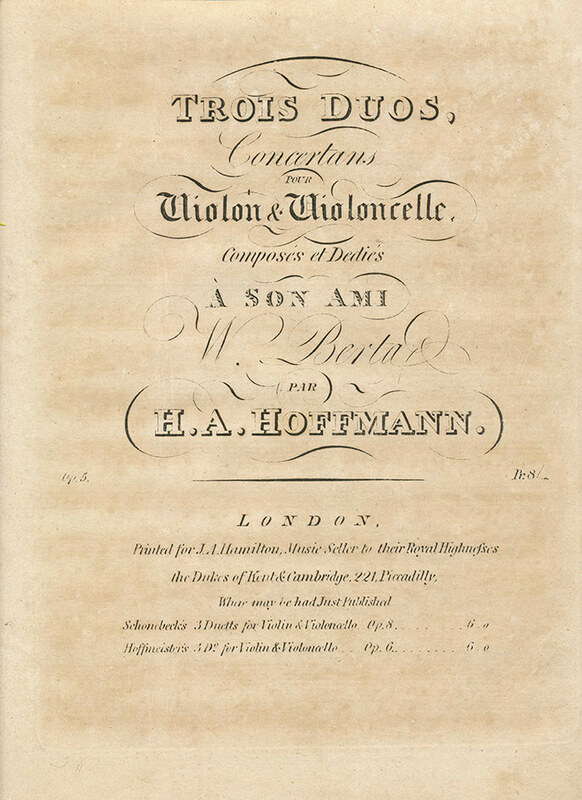 Set of three 1803 (parts only) and modern performing edition, score and parts, including cello part. Duo No. 1 in C Major has a sonata form first movement and a Rondo second movement marked Allegro. There is no slow movement. Duo No. 2 in A Minor has a sonata form first movement, a Larghetto second movement and a Rondo third movement marked Allegro con moto. Duo No. 3 in E-flat Major has a sonata form first movement and a Rondo second movement marked Allegro con moto. There is no slow movement.